BEACON FALLS — The quick actions of two men helped to save a building threatened by a dumpster fire Friday afternoon. Beacon Hose Company No. 1 responded to a dumpster fire at Station-Glo on Noe Place and South Main Street at about 4:30 p.m. When firefighters arrived the dumpster was in the middle of the parking lot, which was not where it had been when the fire broke out, Assistant Chief Brian DeGeorge said. The dumpster was about 2 feet away from the Station-Glo building when the fire started, DeGeorge said. Eric Weid, the nephew of Beacon Hose 2nd Lt. John Weid, with the help of Eric Battis, an employee of Station-Glo, hooked up the flaming dumpster to a wrecker from Ace Auto, which is next to Station-Glo, and pulled it away from the building, he said. Thermal imagery showed hot spots on the Station-Glo building, DeGeorge said, but it didn’t catch on fire. Had the dumpster not been moved, he said, it’s likely the fire would have spread to the building making the situation much more serious. “Because of their actions, it definitely saved the structure, no doubt,” DeGeorge said. 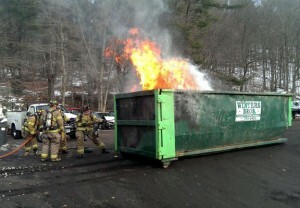 Engine 3 was the first on scene and worked to open the dumpster to extinguish the fire. Engine 2 and Rescue 4 arrived shortly afterwards. The fire was contained to the dumpster. Firefighters found smoke in the attic of Station-Glo and ventilated the building. A total of 17 members responded to the scene. The cause of the fire has yet to be determined.